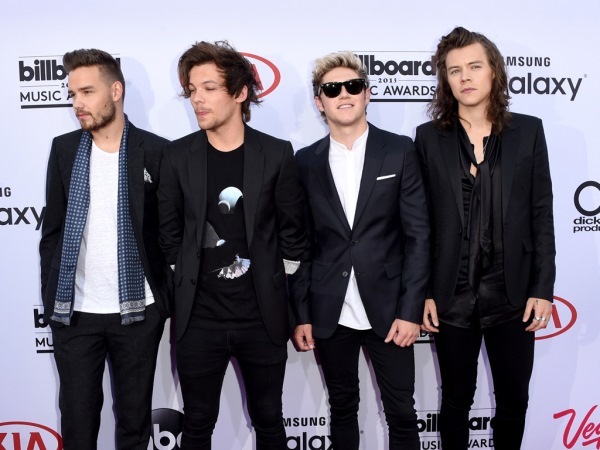 One Direction acknowledged their "brother" Zayn Malik at the Billboards last night. The British boyband are one man down since Zayn decided to leave the group in March, with remaining members Harry Styles, Liam Payne, Louis Tomlinson and Niall Horan holding up the fort. At yesterday's event they picked up the award for Top Duo/Group and despite rumours of tension between the band and Zayn, they gave him a shout-out in their acceptance speech. "As Niall said, this one's for the fans," Liam addressed the audience. "But there's one more person to share this with, and that's our brother Zayn." Since the 22-year-old left the band claiming he just wants to be "normal", there has been speculation about who will be next to go. But Louis assured none of them are looking elsewhere. "We're not breaking up. We're having too much fun!" he grinned to E! News. "We're making our record at the minute, we're going on more tours, we're coming out to the states in July – we're looking forward to it, it's all good." Harry added that One Direction are always looking to be "bigger and better" so their fans stay entertained. Since leaving, Zayn has apologised to fans, admitting he feels bad for leaving them in the lurch. And it's not just the Directioners who felt betrayed by the young star. "At first we were a little bit angry, we were surprised. I think we all knew the general vibe that Zayn was feeling. You could sort of tell. And from the outside people could tell," Liam recently told talk show host James Corden. "There’s certain parts of this job Zayn loved and there’s certain parts that he didn't. And if you don't like your job you've gotta follow your heart sometimes and go where you need to go… we were angry at first and then it was just more disappointed. We wish him the best of luck with whatever he gets up to. There’s no hard feelings."